The lunar landing missions of NASA mark the pinnacle of human space exploration, as they remain the only time humans have stepped on the surface of something other than earth. The technological achievements to get to that stage were immense, even more so in an era before supercomputers, which makes the accomplishments even greater. Given all of this great success of the Apollo program, it is somewhat surprising that we have not been inundated with detailed models of all the various vehicles and equipment used for these missions. Most of the model kits out there represent pre-production and prototype vehicles, rather than the actual operational Apollo/Saturn modules. Dragon has decided to address this lack with a whole range of new kits. 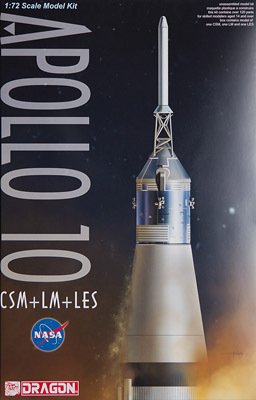 This release in Dragon's growing Saturn V/Apollo series covers the Apollo 10 Command Service Module (CSM), Lunar Module (LM), and Launch Escape System (LES). Launched on May 18, 1969, Apollo 10 was a full scale lunar orbit LM test, and the LM (named 'Snoopy') descended to under 50,000ft over the lunar surface before separating the descent stage and returning to the CSM. Snoopy was eventually separated from the CSM and put into a solar orbit, where it remains to this day. In fact, a group of amateur astronomers in the United Kingdom is attempting to locate Snoopy, using data from NASA and the Faulkes Telescope Project. As Snoopy is the only surviving operational spacecraft, finding it would be a great achievement. 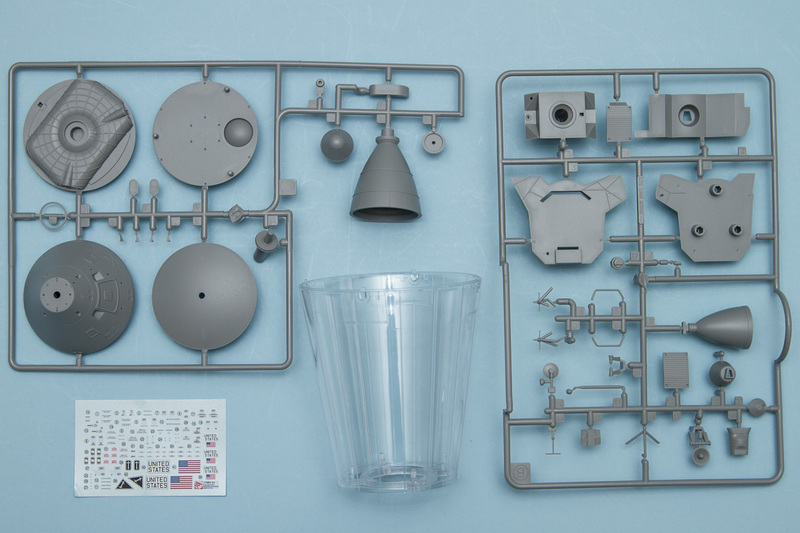 The kit comes molded in black, gray, and clear plastic, and the level of detail throughout is absolutely stellar. When finished this will definitely look stunning, and for those who don't necessarily have the space for a full Saturn V stack, this kit will provide most of the fascinating bits, and display it in an interesting manner (more on that later). Construction begins with the CSM. This is made up of a three piece barrel, which would be a difficult assembly to align, but the kit provides two rings to put the pieces around. This is a great way to keep the detail crisp on the barrel, while keeping the assembly easy. The capsule portion is molded in two main pieces, a top and bottom, which again provides great molded-in detailing and minimizes seams. The docking module is made up of five separate pieces and once done will look quite nice. The control jets are separate and nicely done, while the main rocket engine is done as one piece and fits into a separate lower CSM piece. Once together the CSM will look quite nice, but much of the capsule detail will be hidden by the LES. 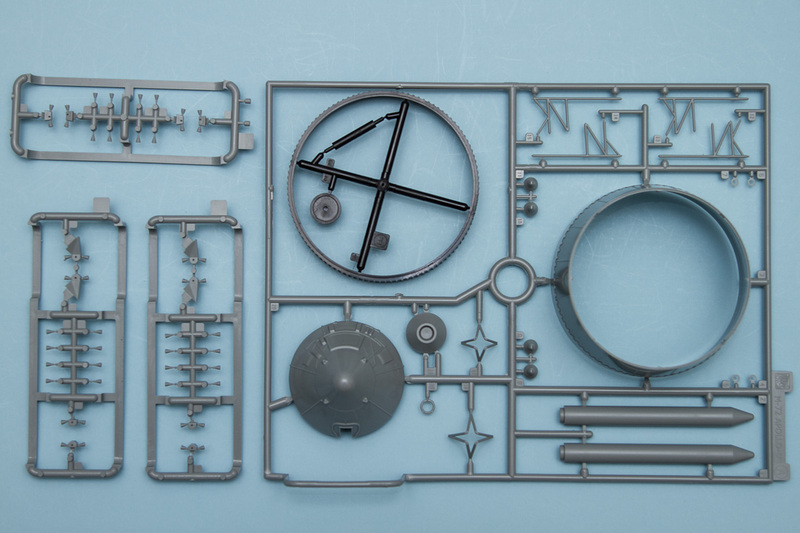 The Lunar Module is probably the most complex assembly in this kit. The ascent stage is made up from quite a few pieces. This complex assembly is required to keep the detailing as crisp as possible, and while complicated, it looks like Dragon has taken the time to engineer it well enough to ensure positive alignment. There are nine major pieces to build the main ascent stage, upon which go quite a few smaller details such as antennae and control nozzles. The descent stage is simpler, as that is molded as one main piece that gets separate folded landing legs and descent rocket. There are some other smaller details that fit onto this piece, and the ascent stage fits onto the top of the descent stage via a large peg. Finally, we get to the LES. This is very simple to put together, especially after building the LM. The rocket system is built up from two main pieces, which then get separate rocket nozzles. This completed assembly then fits onto a six-piece strut system that then fits onto the cover that fits over the CSM capsule. The CSM then fits onto the next stage, which is the interesting part of this kit, as it's molded in clear. This will allow the finished model to show the LM in place, but still show the complete spacecraft upper stage of the Saturn V. All of this then fits onto the included base, providing a great finished display. There is a small decal sheet that provides various national markings, stenciling, and details for all the various parts. The painting and decal instructions are provided in color on the bottom of the box, which is great for modelers looking to see what you get in the kit, but can be a bit challenging for actually applying the decals as it's not easy to prop up the instructions to look at while doing the work. You'll note that I have not touched on the accuracy of this kit. Taken as a whole, it's quite good, and much better than any other injection-molded kit out there. However, for the purists, it will fall short in many areas. 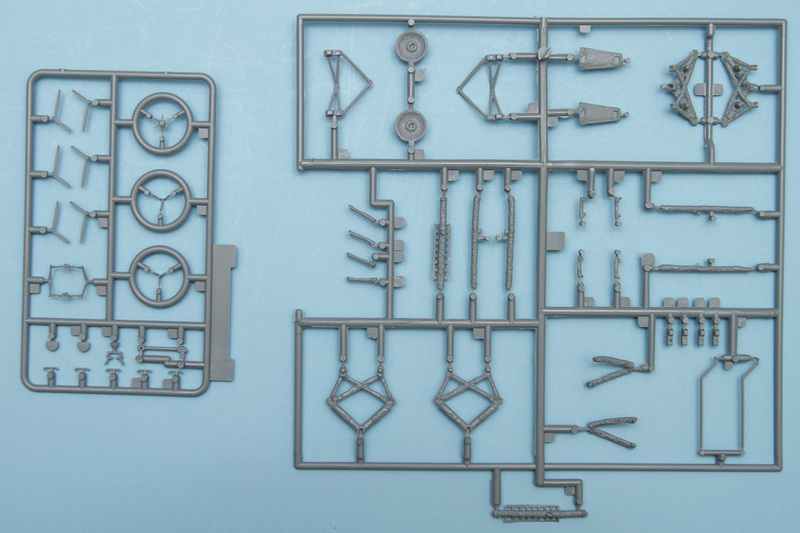 Dragon, understandably, wants to get as much mileage out of their toolings as possible, so at best these kits will be a generic Apollo/Saturn V model. Each mission featured differences in the CSM and LM, and tooling these kits to reflect those subtle differences would have been an expensive proposition. As such, these kits should form a great starting point, and with a bit of extra work could be made into accurate representations of mission-specific spacecraft. 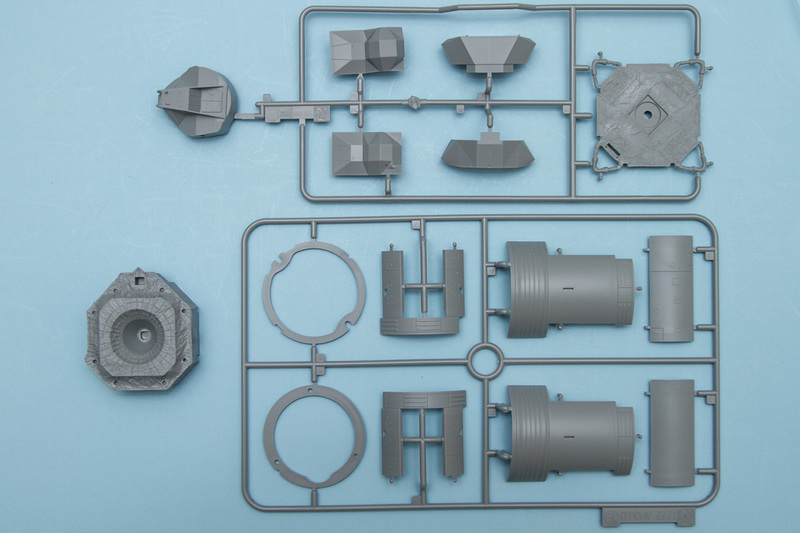 For those looking for a detailed representative example of the Apollo program, these kits will build up out of the box quite well and will definitely look the part. Out of all the 1/72 Apollo kits Dragon has released, this one is the most appealing to me as it provides the entire spacecraft stack in one kit, allowing the modeler to display a significant portion of the Saturn V without taking up large amounts of space. My thanks to Dragon USA for the review sample.